The story of the fight for Votes for Women reaches an ever-wider audience. To coincide with the opening of the film Suffragette, the Houses of Parliament put on some special events, including a tour and talk on the main suffragette activity within the House. It was interesting to see St Stephen’s Hall where women had chained themselves to statues, and where this window now stands. In the lobby are the grilles that used to form a barrier between the Ladies Gallery and the House of Commons (women were not allowed to sit in the public gallery). Famously, the grilles were cut out of the Ladies’ Gallery when Muriel Matters and others chained themselves to them and hid the keys in their underclothes! Muriel Matters came to speak in Ipswich more than once at the invitation of local suffragette leader Constance Andrews. 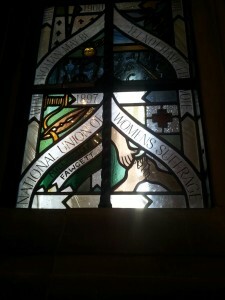 The tour made immediate and real the connection between the suffrage campaign, Parliament and democracy. I heard an alarming statistic – there have been over 10,000 male MPs, and only 451 women! It was also great to preview the work of art currently being created to commemorate these women. Over 700 people across Suffolk, mainly women, have heard me talk about the Ipswich Suffragettes during 2015 at 25 different meetings. I am always fascinated by the issues that come up in the Q&A afterwards – a lot about the bravery of the campaigning women, the continued fight for women’s equality, the state of our democracy, the difficulties of women in parliament and so on. At a study day, we had time to consider the risks the women of 1911 took when they followed Constance Andrews into Ipswich’s Old Museum Rooms for the night to avoid the Census. Worries about the legality of the action, darkness, hostile opponents, transport, domestic pressures, standing out from one’s neighbours all reminded me of how courageous women in towns like Ipswich had to be to fight for the vote – and increased my continued admiration for them. 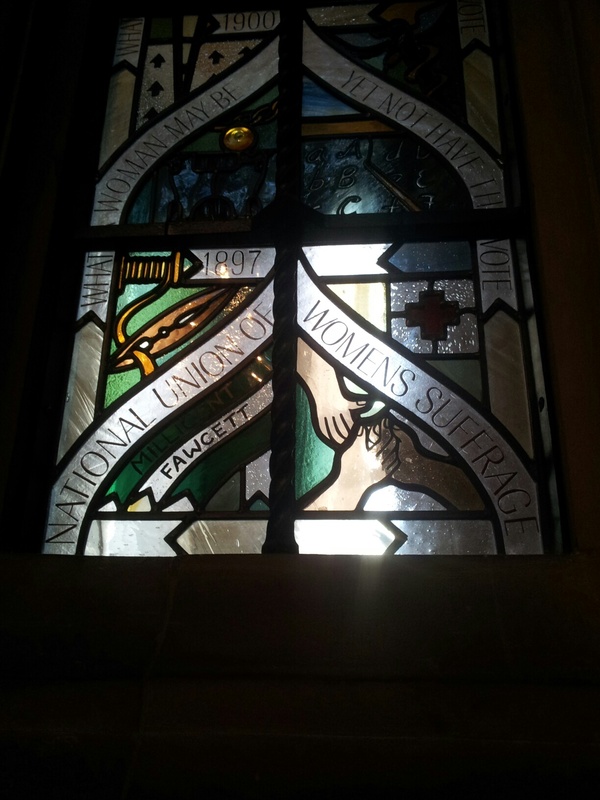 A significant highlight was of course the film Suffragette. The very fact of a large-scale movie on general release was amazing in itself – the story of the long fight for the vote for women has not been seen as a worthy subject for film in modern times. Many like me must have worried that it wouldn’t do the women justice. But it did! It was a remarkable film. Two people independently said that they had seen Constance Andrews’ name in Inspector Steed’s record book. It’s possible, as she was active in London at the time of the film’s action, and served a term of imprisonment in 1913.